While coming up with post ideas for our blog. I thought of having a place to help those of you that enjoy doing DIY projects or tools like myself. As it says in the description, “This side of the blog is about sawdust, not glitter.” If you’re just a beginner or even if you consider yourself a DIY expert than you may want to take a look at what is here and what’s to come in future posts. Just kidding! Those are tool most of us usually start with before even getting into DIYs. The tools I’m about to cover are tools I have borrowed on a regular basis from family and friends. Soon after doing a large DIY build, I realized I had taken these tools for granted for the longest time and really needed to add them to my toolbox. 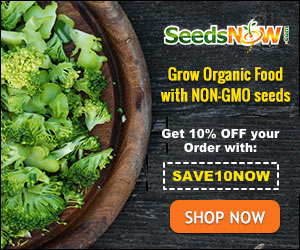 I finally broke down and purchased them and hopefully, I can help you by starting out or help you rediscover some of these tools. What Tools Are In The Toolbox? Now that I’ve gotten your interest and know what’s not on the list. Let’s crack open the lid and start going over the tools you’re so eager to read about. Though it is not in your toolbox but on the workbench, it is one of the more handy tools you should have in your arsenal. I can’t even count the number of times I’ve had to take parts or a project over to my father-in-law’s to use his vice. When I need a part of my project held down so I can beat, bend, twist, drill, etc on it than the vice is my best friend. It is one of those tools that is still on my wish list. Sorry I couldn’t resist. Anyhow, they come in various shapes, sizes, and colors. 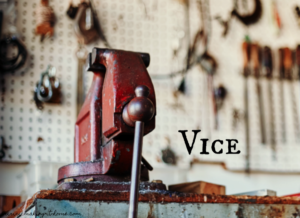 Some are simply just the vice and others have some added features. Whichever you decide to go with you will not regret it. 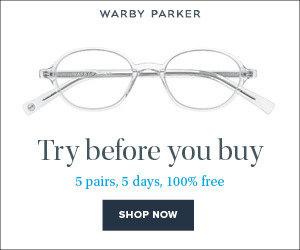 They will last you a lifetime and maybe longer. Have you ever been working on a DIY and wish you had a second set of hands or a helper? I have and here is your answer to fix that issue. Clamps! One of the tools I have borrowed from many family members and friends. Actually, I think I’ve had three different people’s clamps at one time for a project. The clamp does a similar job as the vice but is much more portable and has a large area between the jaws. it is a must-have tool to add to everyone’s toolbox. 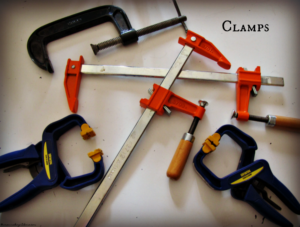 The types of clamps vary from the old school C clamp to the newer quick clamps. It’s a tool you can’t just have one of because they are so handy to have around. “The more clamps I have the more helpers I get.” that’s what I tell myself or the excuse I give the wife to get more. One of my favorite tools to use on projects and jobs around the house is this convenient tool. 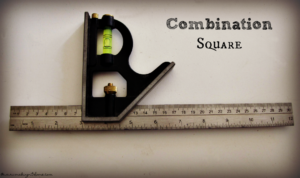 The combination square is one of those tools that would mysteriously end up at my house to help with a DIY. Not only is it a ruler, it’s also a small straight edge, level, and is set for either a 90 or 45-degree angle for easy marking on the fly. Another nice thing about this tool is the sliding handle. When you are going to be repeating a measurement while working on a project the combination square has you covered. Well, at least it will for up to 12 inches. Just set your measurement on it, place where you need it, and mark out your line. If you haven’t got your hands on one of these then you should. Here’s an old-school tool that will never get replaced in my toolbox. Like the combination square, this bad boy is a multi-purpose tool and then some. 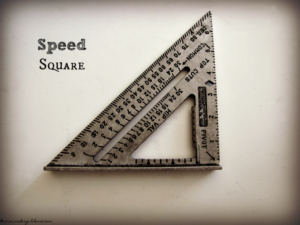 The speed square has a 90 and 45-degree angle on its triangular body for quick marking and a protractor marked out along one edge to figure out angles. There are so many things this simple shaped square can do that I could write a single post on it. 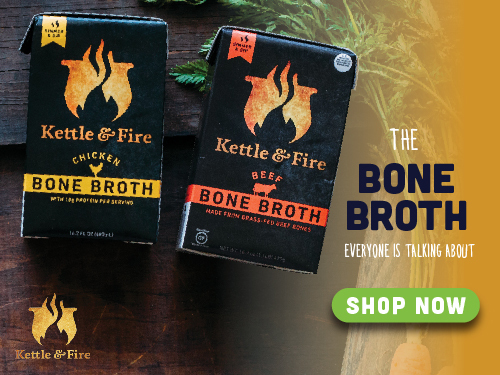 Trusted by me and many other men before me, this is a fantastic tool to have available. Last but not least is the level. Most of us have one but I added it to the list for a couple of other uses for it. Besides using it to level out things around the house. You can use the larger levels as a straight edge when one is not handy and a guide for some of your powered cutting tools like a circular saw. Make sure the construction and materials for the level are top quality and strong enough for the guide option though. 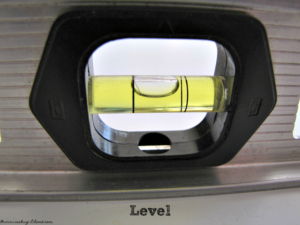 In addition, if your level does not have measurements marked out along one side then I’d take the time to do that yourself. This is one thing I did and it helped me speed up work time on many projects. That’s it for the DIY Toolbox this month I look forward to continuing to post more for all you DIYers out there. Hopefully, this list helps you out to get a good start for tools or makes you look at those old ones in a new light to complete a DIY like I did. « My Dad the Daredevil – How my Father Inspired Me to Follow My Dreams. Next Mother’s Day I could use a combination square! Good info!